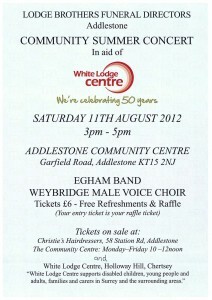 On Saturday 11th August 2012, Lodge Brothers Addlestone will be hosting a Community Summer Concert at the Community Centre, Garfield Road, Addlestone, in aid of the White Lodge Centre in their 50th Anniversary year. The centre provides valuable support for disabled children, young people and adults, families and carers in and around the area, and Lodge Brothers are proud to support this worthy cause. Tickets are £6 which includes entry into the raffle. Free refreshments will be available throughout.